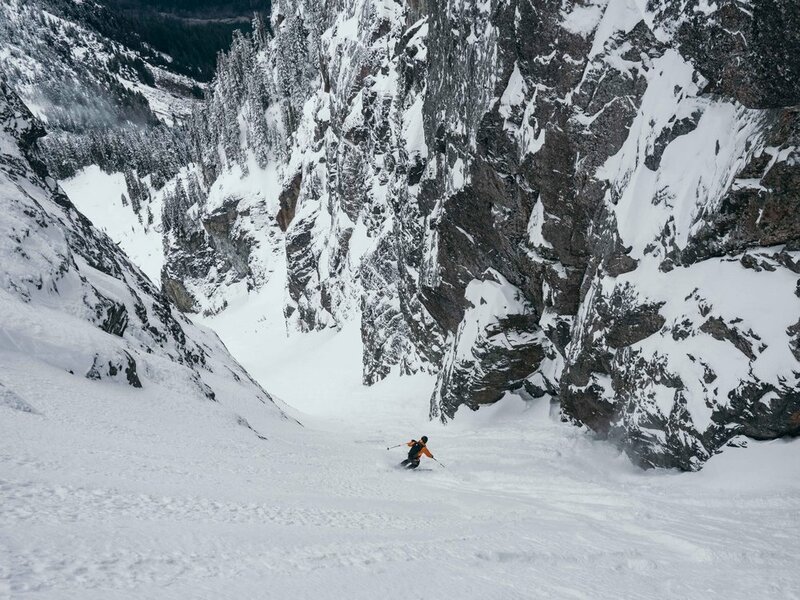 This past weekend a few friends and I headed out to ski one of the classic lines at Snoqualmie Pass - the Slot Couloir off the north side of Mt. Snoqualmie. 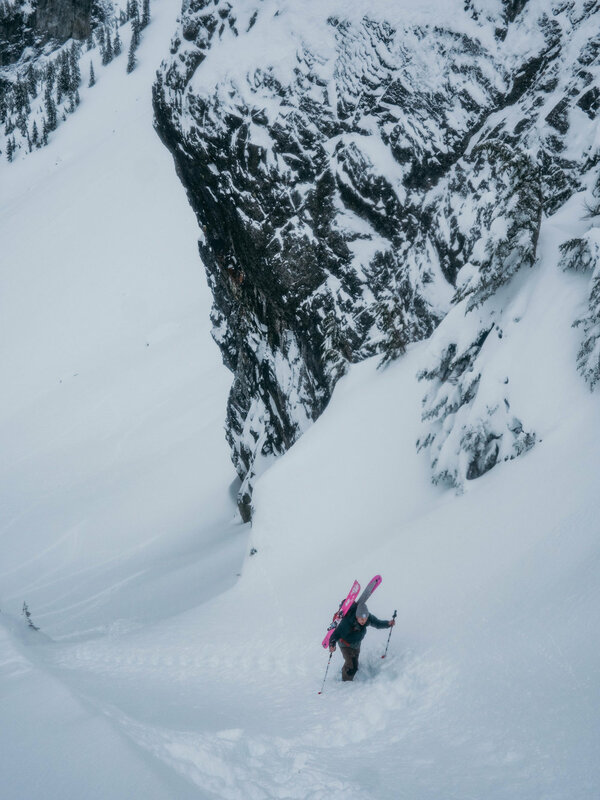 There are a few things that have to line up to get me really psyched to ski bigger objectives. The first is that the NWAC avalanche forecast has to look good, and the second is that weather has to be lining up to not blindside us with any surprises. My favorite weather website for skiing in Washington is by far Winter Science, since you can look at compiled radar data for everything from precip, snow levels, elevation specific wind and cloud patterns, etc. It’s worth noting here, that one of the things that I love most about working for LOGE is our giving program to local non-profits that support responsible outdoor use, including NWAC, among others. We believe that helping people access the outdoors creates more people that will fight to protect the wild places, and therefore give 2% of revenue to non-profits that support responsible outdoor use. 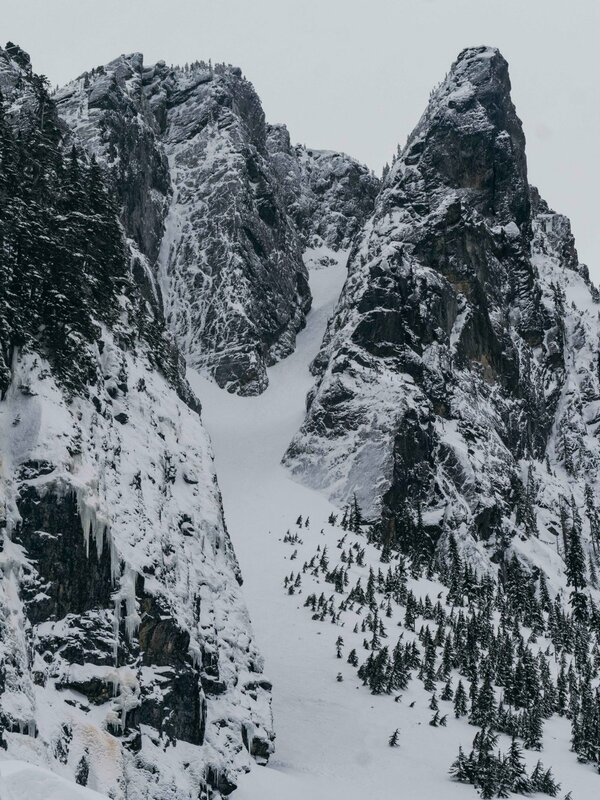 I have read the NWAC forecast daily for years, taken avalanche education courses from NWAC professional observers, and benefitted from their efforts basically every day I’m out skiing, so I get fired up that LOGE is able to support them in the way we do! On this particular morning, we had a few gear issues low in the misty old growth forest, but after sorting them out settled into a nice chill pace that took us out of the valley fog and onto the upper slopes of Mt. Snoqualmie. The NWAC forecast was at Moderate, citing recent storm pockets at upper elevations that were in the process of strengthening, so we figured since we were only a few hundred feet of elevation from the entrance of our couloir, this was a good spot to dig a quick pit and check out what was going on with the snowpack! I tend to like to dig pits often, and in a few minutes we had a nice pit and did a few quick tests - layer hardness, compression test, and extended column test, which all showed a favorable snowpack for safe skiing! Onward to the entrance of the Slot! Our friends, who had a group of 5, happened to pass our group of 3 while we were digging our pit, which made for a pretty fun transition at the entrance! 8 is a pretty large group for this type of line, however we had 3 radios among us, so we decided that we would send Jackson first with a radio to let us know how it skied, and then I would take a radio and ski halfway down to a safe spot to take pictures and let the others at the top know when the last person was clear and it was safe to drop. 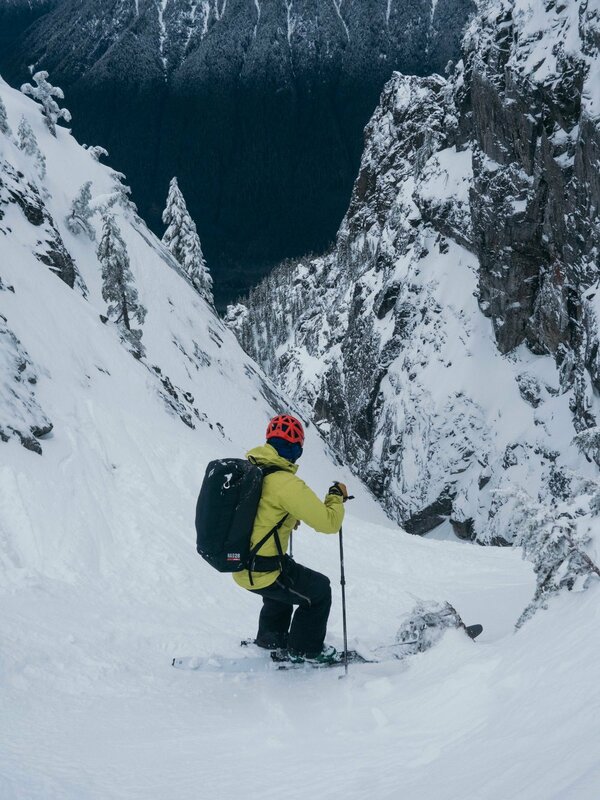 Jackson dropped in a made smooth controlled turns till he crested over the dogleg and ripped all the way to the bottom of the 1000ish foot line. 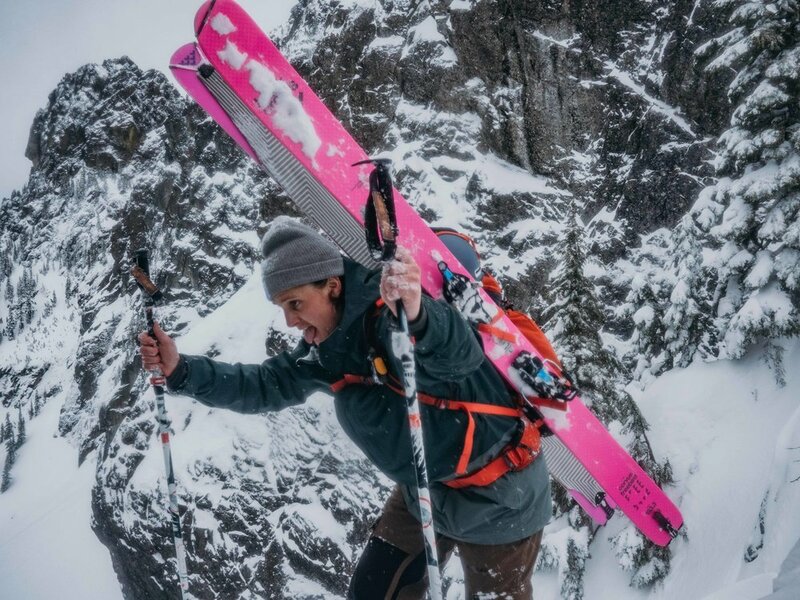 We heard him come on the radio “it’s a little icy in places, and is sluffing quite a bit so be cafeful.” We all kept that in mind as we skied, being cafeful to stay out of the gut of the line where the sluff could easily carry you if you let it build up. I dropped in and skied till I found a nice safe spot left of the main line and posted up with my camera and radio. It was pretty fun watching all the friends ski, and with their varying paces to the bottom, we definitely made a good call to use the radios, as someone could have easily gone too soon and flushed the person before out the bottom. Katherine making it look easy! We were stoked at the bottom and high fives were in order, but there was still work to do to climb out the exit couloir! We let our friends group of 5 take off while I backtracked to grab a quick picture of the line from the bottom. There was quite the cornice hanging out about the exit couloir, so we did our best to stay out of its direct path and limit any time spent directly under it. Luckily it had stayed cold and we had no issues with it. Our friends made it up and out and we soon followed, booting the final hundred feet or so. 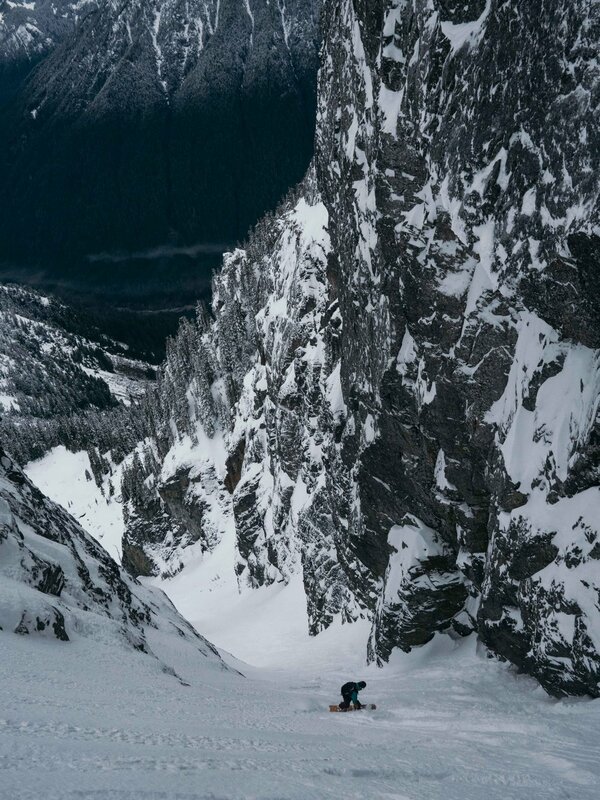 Ben makes it out the exit couloir, now all that’s left is the mank-ski down to the car! All in all it was an awesome day in the mountains with good friends! We skied an awesome line, and had a blast along the way. Newer PostJoin the LOGE Squad! !